CHRISTCHURCH, New Zealand, September 3, 2010 (ENS) – A severe earthquake of magnitude 7.4 shook the South Island for at least three minutes early Saturday morning, at 4:35 am local time. The quake was centered 30 kilometers (20 miles) west of the city of Christchurch at a depth of 33 kilometers, according to the New Zealand GeoNet. Power and water services were knocked out across Christchurch, a city of 372,000, where facades fell off buildings and homes and bridges were damaged. Christchurch Airport is closed. Christchurch is the largest city on the South Island, and the country’s second-largest urban area. Orion Energy is working to restore power in Christchurch where some power lines are down and in parts of rural Canterbury, which also lost electricity. Christchurch Civil Defence Group has activated its emergency operations center. There are no reports of deaths, however there have been reports of injuries. Running on generator power, Christchurch Hospital is trying to cope with a flood of injured people but police say the injuries reported so far are minor. 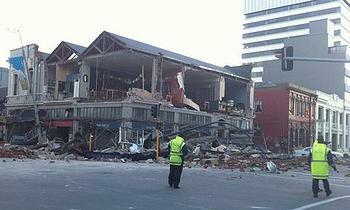 Christchurch police have shut down the central city streets, some of which are blocked by damaged buildings. Radio New Zealand reports sewer lines and water pipes have ruptured throughout the city, and whole substations are offline. Christchurch Mayor Bob Parker told Radio NZ that infrastructure checks are underway. The mayor says most of the damage seems to be to older buildings and he is urging people to conserve water and stay off the roads. There have been three significant aftershocks, measuring between magnitudes 5.7 and 3.9. Mt. Hutt has been closed to skiiers as the ski resort lost power due to the earthquake and an infrastructure assessment is underway. The Pacific Tsunami Warning Center in Hawaii said there is no immediate danger of a Pacific tsunami. Earthquakes occur regularly in New Zealand as the country forms part of the geologically active Pacific Ring of Fire. About 14,000 earthquakes, most of them minor, are recorded each year. About 200 of these are strong enough to be felt. The biggest known earthquake in New Zealand was the magnitude 8.2 Wairarapa earthquake of 1855 east of Wellington.